If you're interested in nineteenth century trade patterns nineteenth century patent medicine bottles are a godsend. They're usually readily identifiable, often embossed with the manufacturers name or logo, and what's more, durable, attractive and collectable, which means that they turn up for sale on sites like ebay and gumtree, as well as more specialist bottle collecting sites. So by treating ebay as a research resource, you can readily work out the rough distribution of the bottles - for example in both the cases of Hayman's balsam of horehound and Jacob Hulle, ebay gave me a rough spread of the bottles. But of course it's not perfect. For a start there's no real provenance. We don't know where the bottles were found, or indeed under what circumstances. We don't know a date, even a hand waving one based on other items found with the bottles. For example, with Jacob Hulle, we know that the company was operational for roughly ten to fifteen years, which can give us a rough date. For Hayman's it's a bit more difficult. 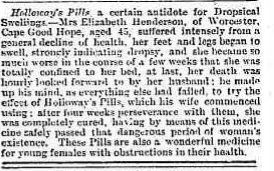 I've found adverts as early as 1861 and as late as 1895, which probably brackets the lifespan of the product. There's no real way of dating anything more exactly. And of course, I'm making a big assumption, that the vendor is located close to where the bottle is found. It may of course been traded on at a collector's fair and have been found several hundred kilometres from the vendors location. But then we turn to places such as South Africa.